Our first stop for #BRW2016 was lunch at The Gardens Cafe by Kathy G and it set the tone for a wonderful restaurant week experience! We ate on the patio to take advantage of the cooler weather after the rain. 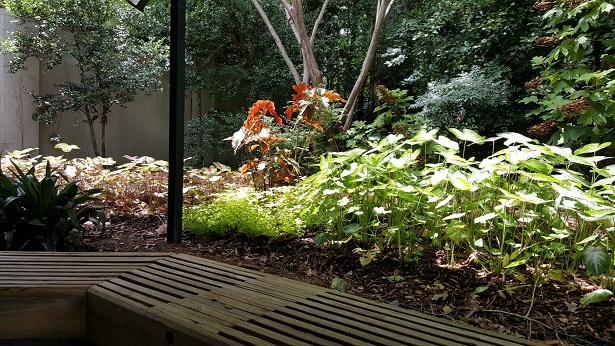 While on the patio you definitely feel immersed in the Botanical Gardens experience due to the gorgeous flowers and plant life that surround you. 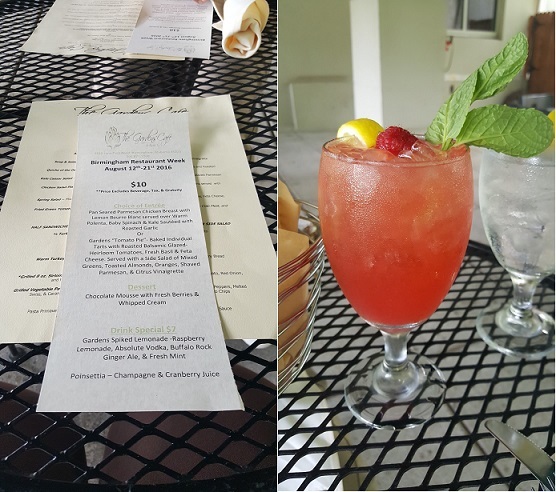 We took in our surroundings while snacking on the warm bread that was provided and sipping on a refreshing Gardens Spiked Lemonade topped with a mint leaf and raspberry! The Garden Cafe offers $10 options for Restaurant Week, but based on the quality of the food we were surprised that they weren't in the $20 category. It's definitely one of the great deals we are sure to find as we progress through the week. 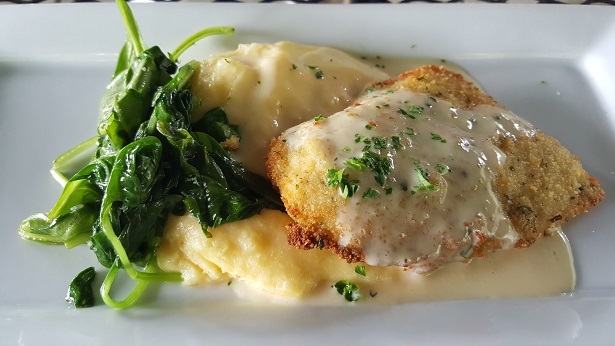 We tried the Pan Seared Parmesan Chicken Breast with Lemon Beurre Blanc. It was served over warm polenta, baby spinach & kale sautéed with roasted garlic. It was just as amazing as it sounds. The chicken was warm and tender with just the right amount of crust while the polenta was a perfect consistency and was very filling. Normally we think of polenta as being a bit bland, but the sautéed spinach and kale gave it a great garlic flavor! 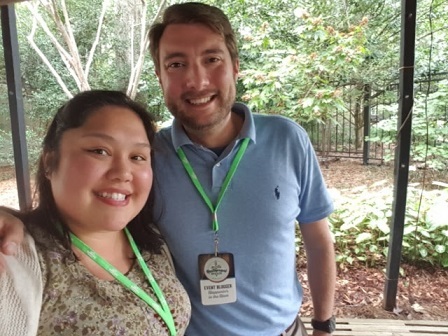 Since there were two of us, we also got to try the Gardens “Tomato Pie.” If you could assign a dish to represent memories of childhood summers in the south, this has to be it! It's an individually baked Tart with Roasted Balsamic Glazed-Heirloom Tomatoes and Fresh Basil & Feta Cheese. We were hooked after the first warm bite! The crust of the Tart is a perfect contrast to the creamy center and the tomatoes were bursting with flavor. 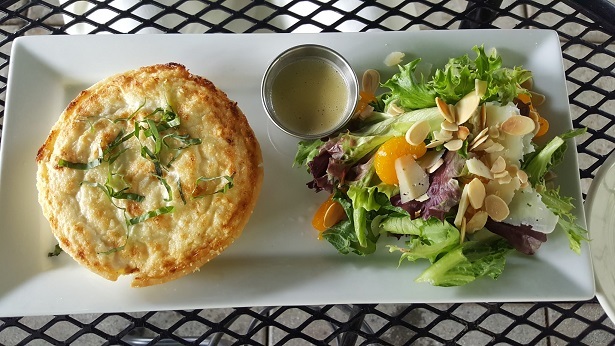 As if that's not enough, it is served with a Side Salad of Mixed Greens, Toasted Almonds, Tiny Oranges, Shaved Parmesan, and a Citrus Vinaigrette. It was cool and crisp with a refreshing hint of citrus that was the perfect complement to the Tart. We shared the the two dishes and snapped a few photos for our social media. We totally forgot that the meal comes with dessert! 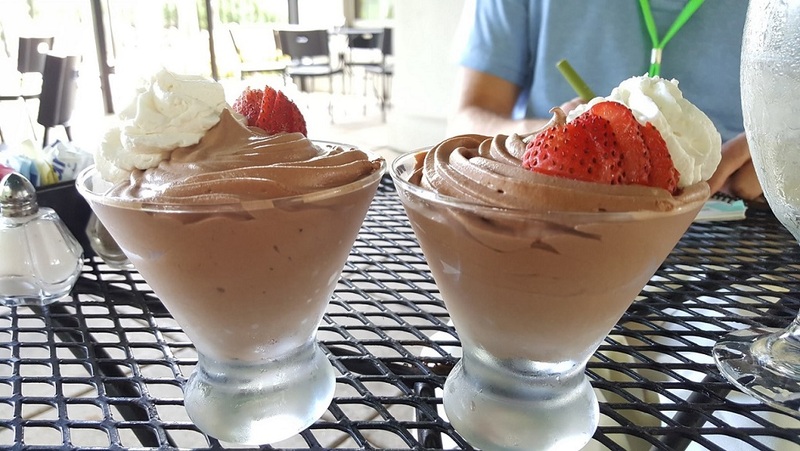 Before we know it, our server presents each of us with a glass cup of Creamy Chocolate Mousse topped with Whipped Cream and Fresh Berries! (YUM!) We immediately posted a photo to Instagram! :-) It capped off the meal perfectly! Over all the meal was light, yet very filling. Everything tasted great and our service was impeccable. Everyone was so gracious. The manager and chef both came out to check on us during the meal a few times. 2. We are coming back soon. 3. How have we never been here before?! But there in lies the magic of Birmingham Restaurant Week. It connects the people of Birmingham with amazing restaurants that they may have previously missed out on. We hope each of you try The Gardens Cafe over the next week and enjoy their incredible menu! Be sure to follow us on social media as we will visit nearly 2 dozen restaurants during Birmingham Restaurant Week. We are on Instagram and Facebook as @happeninsintheham and on Twitter and Snapchat as @BhamHappenins. BRW runs from Friday, August 12 to Sunday evening, August 21, 2016.